The Moon used to spin on a different axis and show a slightly different face to the Earth, a new study suggests. Using data collected by Nasa’s Lunar Prospector mission in the late 1990s, scientists spotted two hydrogen-rich regions near the Moon’s poles, probably indicating the presence of water ice. The icy patches are opposite each other – the line between them passes through the middle of the Moon – so it appears that this used to be its spin axis. It describes a gradual wobble, or “true polar wander”, adding up to about a six-degree shift altogether. A likely explanation for this shift, which the researchers suggest took place over several billion years, is volcanic activity in a region called the Procellarum. This swathe of territory includes most of the Moon’s dark patches that are visible from the Earth. 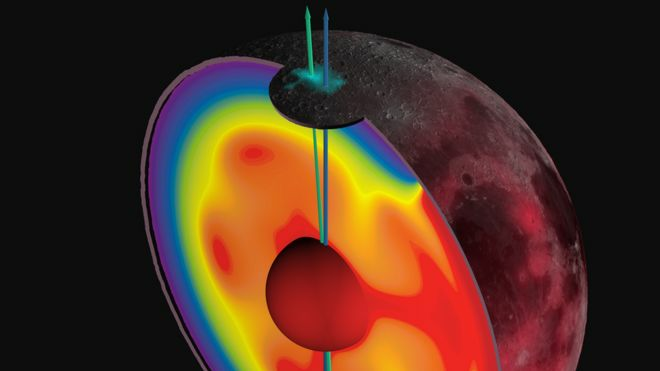 Volcanoes and associated geological activity would have made it warmer and lighter than the rest of the Moon. According to Matt Siegler, from the Planetary Science Institute in Arizona, and his colleagues, that drop in density produced enough wobble to explain the two “palaeopoles” they detected in the Lunar Prospector data. “The Procellarum region was most geologically active early in lunar history, which implies that polar wander initiated billions of years ago,” they write. 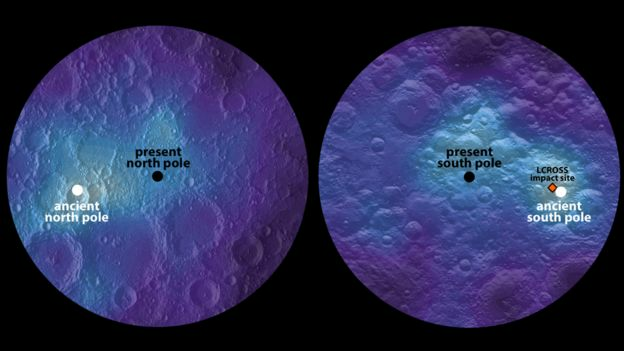 Image caption: The presumed icy patches are opposite each other, nearby the present lunar pole. Dr Siegler and his colleagues discovered the hydrogen-rich patches in data from the Lunar Prospector’s neutron spectrometer: measuring the neutrons bounced off the Moon’s surface by incoming cosmic rays. That hydrogen signal is taken to indicate the presence of water ice, which can –and does – exist in permanently shaded craters at the Moon’s poles. Precisely why it has persisted in these regions, which have now drifted away from the poles and into sunlight, is a mystery. The researchers suggest it may have been buried by asteroid impacts, but this will require further investigation. Previous studies have suggested that the Moon may have wobbled around to an even greater extent – perhaps as much as 35 degrees.